Universities-Local Colleges - Holiday Decorating Services - Charlotte NC and surrounding counties. Commercial Holiday Event Decorating Services - Charlotte NC Including surrounding counties in North and South Carolina. Charlotte NC – Holiday Commercial Event Decorating - Redesign + More can help transform your commercial business or retail property into a festive holiday season. Our holiday decorating team is trained and experienced in decorating commercial spaces such as offices, building lobbies, restaurants, retail stores, universities, non-profit organizations, local schools and colleges. We offer a variety of holiday decorating solutions that fit your holiday decorating budget, because we are a holiday decorating company too, we are entitled to many holiday discounts and promotions. We always pass on our holiday savings to each of our clients. 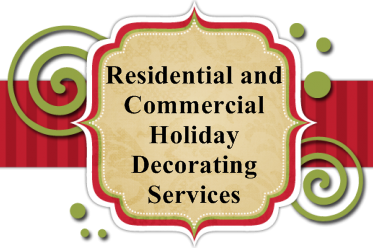 Our commercial holiday decorating services includes: a free on site visit to your commercial business to take an inventory of your holiday décor. Clients are offered a menu of choices to choose from as in holiday decorating packages or select our custom holiday decorating services. We can use your current holiday decorations or suggest a new look and new holiday decorations. Commercial holiday decorations can be rented or owned. We schedule holiday decorating installations between November 1st and December 20th. Holiday decorating uninstalls are scheduled after December 25th. Fees and decorating rental fees are based on your holiday decorating requirements. The holiday season approaches us quickly be prepared and ready for your holiday events, holiday parties etc. Call our holiday decorating team at 704-880-7901 and email us at peggyjohnson@redesignplusmore.com We look forward to decorating your business for the holidays.